As locksmiths in Wallingford, CPPM often visit the area to carry out our range of locskmith services. We thought it would be useful for anyone visiting the area to know more about this bustling town in Oxfordshire and its local attractions. 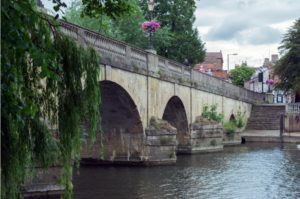 The Romans loved Wallingford, but they proved to be unreliable residents, while the Saxons put in the effort to build the earliest forms of settlements. Agatha Christine wrote her famous works from Wallingford and her grave lies nearby in Cholsey. In the fictional Midsomer Murders, Wallingford is the village of Causton. Nevertheless, this European town is a friendly, scenic town that is located by the River Thames. The following is a detailed guide for visitors to this amazing town. By car: Wallingford town is located 11 miles from Oxford and can be reached using the A4074 after Harcourt Aboretum for some 8.2 miles until you get to Wallingford road. From there, take the 3rd exit from the roundabout and continue on the road till you pass Brightwell Vineyard to get to the town’s centre. By bus: The town is well frequented by buses from Reading and other local towns. By rail: Cholsey Railway Station has a branch line to Wallingford. By boat: You can use the river boat during summer from Reading and Abingdon. While in Wallingford, a visit to the historic Wallingford Castle Meadows is a must-do activity. The meadow runs along the banks of River Thames and contains remains of the ancient castle. For added history, the Wallingford Museum is another site to visit. This museum details the town’s long history from the sixth century to the modern day, and also displays information about Agatha Christine. Other worthwhile places to visit include the Cholsey-Wallingford Railway, the Riverside Park and Pools and the Brightwell Vineyard. This European town has a lot to offer when it comes to eateries and pubs. The Old Post Office restaurant in Wallingford has a relaxing ambience, polite staff and a food menu that includes everything from breakfast, lunch, to Sunday roasts. The Keep is the place to go if you want to enjoy some fine ale, gin or wine. Another amazing eatery is the Waterfront Café by the river, which is very popular during warm days. Other exciting restaurants and pubs include The Bean & Brew, Ribizli, The Cartshed, Busy Brush, The Bout House, Avanti and Anokhi. The Wallingford Carnival is a key event here, which has existed for more than 50 years and occurs every 3rd Sunday in June. This carnival was created for the purpose of raising funds for local charities. The Rugfest summer music festival is another event that occurs in June. This musical festival also offers activities for kids throughout the celebration. Wallingford Museum runs a yearly Agatha Christine Day to celebrate her life and works as an author. The Bunkfest event, which takes place at the end of August and the start of September, offers music, family-friendly activities, silent discos and workshops. Regular entertainment is offered by Corn Exchange, which offers film screenings and productions made by Sinodun Players. CPPM provides reliable and effective locksmith services in Abingdon and Didcot, Oxford and nearby areas. We supply doors, cabinets and windows and our qualified members of staff conduct security checks to ensure homes have maximum security. You can contact us at any time of day to access our locksmith services. For any enquiries please call 01235 239 068 or alternatively send an email enquiry.